Panasonic has launched three new Full-HD camcorders at CES 2012, with the HX-WA20 coming out as the cream of the video recording crop. Presenting three new HD camcorders at the Las Vegas technology convention, Panasonic's new range offers higher resolution image sensors and better low-light performance than previous models. Leading the way, the Panasonic HX-WA20, successor to the award-winning HX-WA10, steps up the game with a range of impressive features, including a image-enhancing engine that lets users capture HD images in dimly lit conditions. Waterproof up to a depth of three meters, the Panasonic HX-WA20 allows users to snap images underwater for up to 60 minutes. The camera is also built with a dustproof design, making the WA20 ideal for a variety of outdoor conditions, without the worry of sand, dirt or anything else finding its way into the interior. Slow Motion Mode lets users capture those sporting moments, recording images at 240 fps with a 640 x 360p resolution for 15 seconds or at 480 fps with a lower 320 x 180p res for 15 seconds, with a playback of slow-motion images at 60 fps. On the flip-side, the HX-WA20's Burst Shooting is incredibly responsive for snapping those fast-moving scenes, capturing at a rate of 40 continuous images in 4 seconds. Users can also take 360 degree shots in Panoramic Mode, simply by tilting the camera vertically or horizontally. 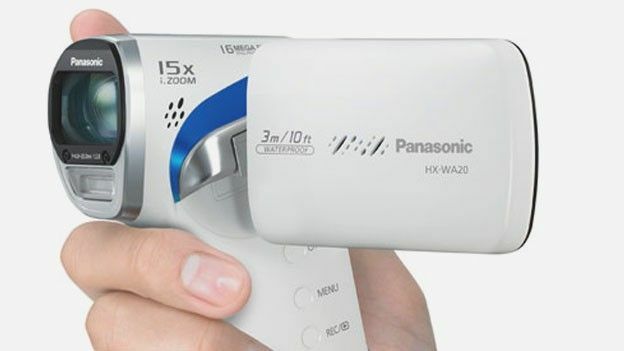 Whist Panasonic has yet to officially confirm a price on the HX-WA20, the video recorder is set to land in the coming weeks with a Panasonic HX-WA20 release date lined up for February of this year. Has the WA20 won you over with its impressive range of features and underwater abilities? Let us know via the comments box below. Polaroid Socialmatic instant camera arriving later this year?